We are currently re-building the TRN Ltd website. 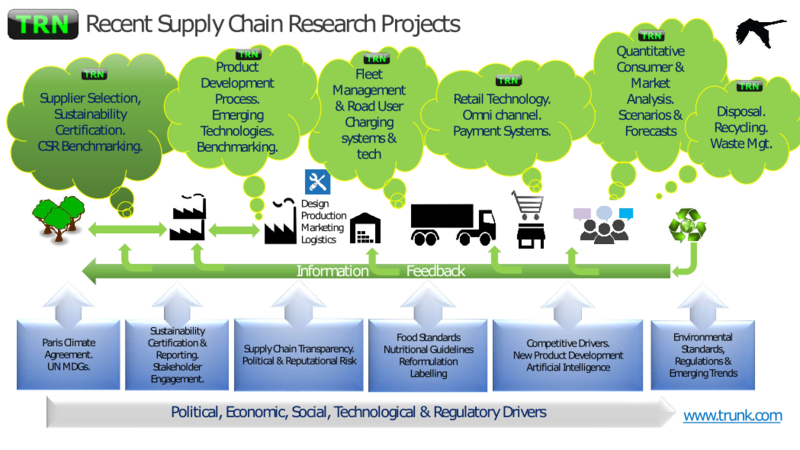 While we do so, please click on the graphic to see some of our recent supply chain projects, or see the text below for a more detailed overview. TRN Ltd is a UK-based research and business development consultancy specialising in the convergence of new technology, supply chain and regulation. We work for some of the leading companies in their sectors to help them navigate the rapidly evolving business environment. We deliver tailor-made solutions, analysis, market data and industry studies, benchmarking and partner assessment, to give senior management the hard data and insights required for formulating and implementing strategic decisions. When senior management needs impartial and deep understanding of rapidly evolving business opportunities, it is time to contact TRN. REPORTS While much of our research is for specific client organisations, we also publish and share results where we can. A number of projects and reports which we have contributed to are now in the public domain and can be viewed by following the links below.